*for Home Sewing and Quilting Machines, Choose Size 9, 10, 11, 12, 14, 16, 18. size 20 only for machine brands and models that will take up to size 20 (135x5 style with Flat Shank, Same Applications as for Commercial Use 135x5 Round Shank, but this needle is Flat Shank like 15x1, HAx1 and interchangeable on portable home sewing machines. Up to Size 18 recommended for free motion quilting, especially with machines on frames going at higher speeds. I placed my order the 1 May 2013 and received it the 7 May 2013. I think that is fantastic delivery. Thank you and I won't hasitate to order from you folks again. I've passed on your website to a few friends. Great needle; going to order more needles. Thanks. Great service--customer service rep was very helpful I would order again. Have purchased from AllBrands since their website inception including several sewing machines. Price and service is always excellent. 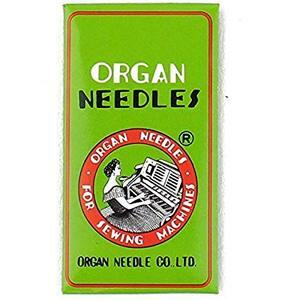 I have never used the Organ brand of Quilting Needles before, but have heard there are a good brand to use. Thanks you for the efficient quick sevice, much appreciated. Very impressive first experience. Will be back to order more items as needed. Great service and prompt response to email about the newsletters. Really appreciate it. I'll certainly buy from you again. Great service, glad you are around. I was amazed at how fast the sewing machine needles arrived!! I am in the process of trying them out on my Bailey Home Quilting machine. I am not sure of they are better than the Schmetz Denim needles that I had been using. But they cost a lot less! I was nervous about ordering online from a company I did not know. Your superior service exceeded my expectations, and I have told several people about your website. Thank you! Good price, good products, and quick shipping. I will shop with you again. I could not find these needles in local shops. Thank you for offering them. The needles fit my machine and are working great. I appreciate you taking time to find out how my order went. I will definitely keep your website available for future use. Thanks for your prompt shipment of my order also. AllBrands is an excellent company with great service and products.I will continue to buy their products. Another Excellent shopping experience~Worry free~stress free~and the best products with the best prices~Thanks! I ordered the wrong needle, it wasn't the company's fault, I just misread. Even the return procedure has been excellent. EXCELLENT SHOPPING EXPERIENCE, WEBSITE WAS EASY TO USE. I WILL DEFINITELY ORDER AGAIN. You have always given me excellant service when I order from you. Thanks it means alot to order from such a caring company.